“Adding Value to America” through educational outreach that focuses on the STEM fields of science, technology, engineering, and math and dedicated to enhancing the performance, success and personal growth of youth. 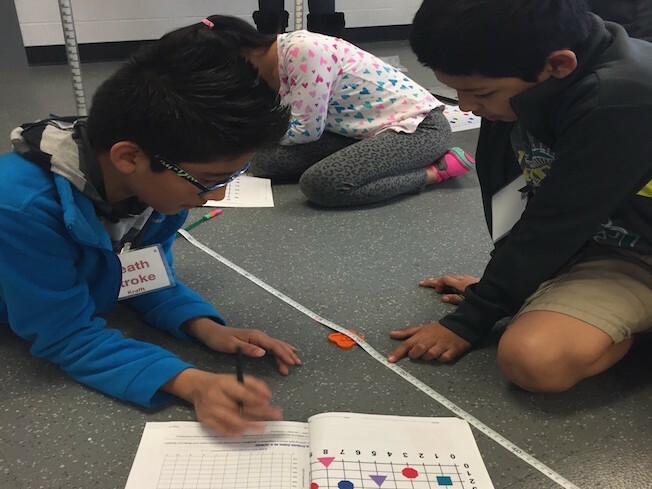 STARBASE Austin objective is to raise the interest and improve the knowledge and skills of at-risk 5th graders in science, technology, engineering, and mathematics (STEM) by offering 25 hours of exemplary instruction using an engaging curriculum that meets and exceeds State Standards. 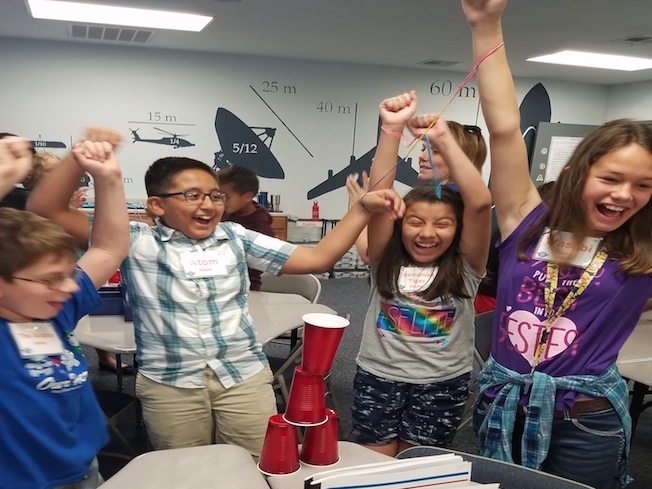 Hosted at Camp Mabry, students participate in challenging "hands-on, mind-on" activities and interact with military personnel to explore careers and observe STEM applications in the "real world." 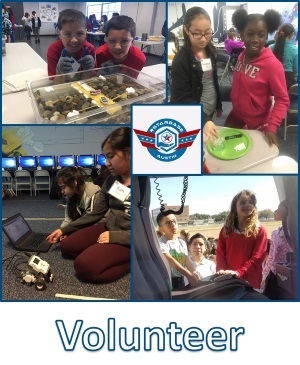 Texas STARBASE provides students in grade 5 a first-hand journey into the exciting world of science, technology, engineering, math, aviation, and aerospace. The program will be conducted at Camp Mabry in a varied and exciting environment, giving students a new perception of the STEM sciences. The curriculum consists of rigorous hands-on minds-on activities, interactive investigations, experiments, simulations, and on-site tours demonstrating use of STEM in the workplace. Classroom instruction includes Newton’s Three Laws of Motion, Bernoulli’s Principle, navigation and mapping, flight simulation, investigations of nanotechnology and nanoengineered products, atmospheric properties, rocketry, engineering design process, computer assisted design (CAD), and 3 dimension manufacturing. Students explore STEM careers, processes for goal setting and teamwork skills, and the importance of staying in school and becoming a life-long learner. Certified educators teach the curriculum with assistance from Guard and community volunteers with technical and content expertise. All curriculum content and student activities are correlated to state and national science, technology, and math standards. We have the capability to accommodate 2 academies of 32 students per Chohort simultaneously (64 students). The instruction is typically delivered in five 5 hour blocks of instruction on one day of the week for 5 consecutive weeks. Our program is funded by the DoD & charitable donations, and is available at no cost to districts in our service area. We partner with a school district via memorandum of understanding (MOU) which outlines the service we provide as well as the requirements of the served district/school for participation. Texas STARBASE, the first program of its kind in Texas, has earned recognition at both local and national levels. It was the recipient of the U. S. Coast Guard Commandant’s National Partnership in Education Award and second place national winner as the National Guard Adjutant General’s Minuteman Mike Youth Program Award. 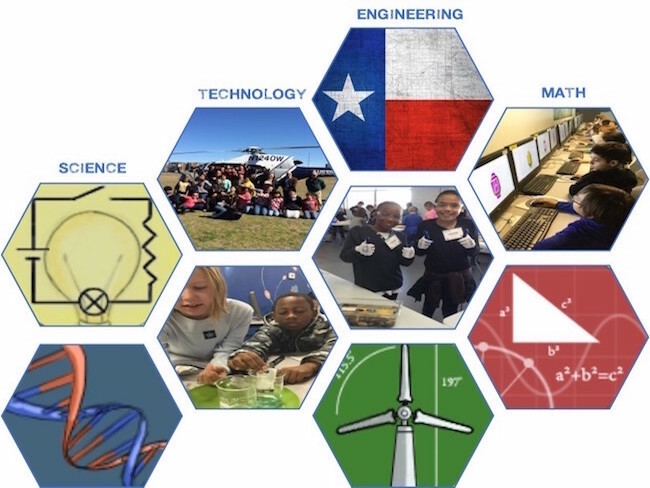 NASA’s International Space Station Team and school district auditors have also recognized Texas STARBASE as a highly effective educational outreach program committed to educational excellence and the personal development of youth. Texas STARBASE has accepted invitations and made presentations at The NORAD Commander’s Conference Spouse Program, The National Interagency Counterdrug Institute, The National Guard Association of Texas Conference, The Texas Federal Women’s Program Annual Meeting, and The Texas Business and Education Conference. Raise student interest and increase student knowledge in the STEM fields of science, technology, engineering and math. Demonstrate the relevancy and use of science, technology, math, and engineering in today’s workplace and encourage students to pursue these fields as their life’s work. Teach problem solving and goal setting skills that build confidence and foster success in the STEM content fields. Develop teamwork skills and provide real world activities to practice these skills. Stress the importance of staying in school and life-long learning. Mr. Yonnone holds a Bachelor of Science degree from United States Military Academy at West Point where he was commissioned as an Infantry Lieutenant in 1999. He was sponsored by Austin ISD to earn his teaching certificate through Region 13’s Austin Teacher Academy program and holds the following certifications: ESL Generalist(EC-8), Technology Education(6-12), Technology Applications(EC-12), Mathematics(8-12), and Physical Science/Mathematics/Engineering. Mr. Yonnone also holds his Masters of Arts in STEM Education from the University of Texas at Austin. Mr. Yonnone joined the STARBASE team in August 2014. Mrs. Badkoobeh holds a Bachelor’s degree in Elementary Education and a Master’s degree in Teaching from Louisiana State University. After university, she taught for a year in Louisiana. Her passion for teaching and learning about education across cultures led her to move to China to teach in international schools. She taught fifth through first grades and worked with developing science curriculum. Upon returning to America, she moved to Austin, Texas and continued to work in education. Mrs. Badkoobeh is passionate about travel, inquiry and empowering students to succeed in learning. She joined the STARBASE team in July 2017. Mrs. Bell earned a Bachelor’s in Business Administration with a concentration in Marketing from Texas Lutheran University in 2008. She has a background in Special Events and Development in Higher Education. Mrs. Bell has also immersed herself in the high temperature electronics industry doing promotions and marketing. She is enthusiastic about creative and engaging learning. Mrs. Bell is passionate about creating excitement and interest in the classroom so students are empowered to succeed. Being outdoors relishing nature, playing tennis and attending country western concerts are her pastimes. Mrs. Bell joined the STARBASE crew in September 2014. Ms. Kerissa Mitchell, aka “Lightyear"
Mitchell holds a Bachelor's degree in Elementary Education with a minor in Biology from the University of Texas at Austin. 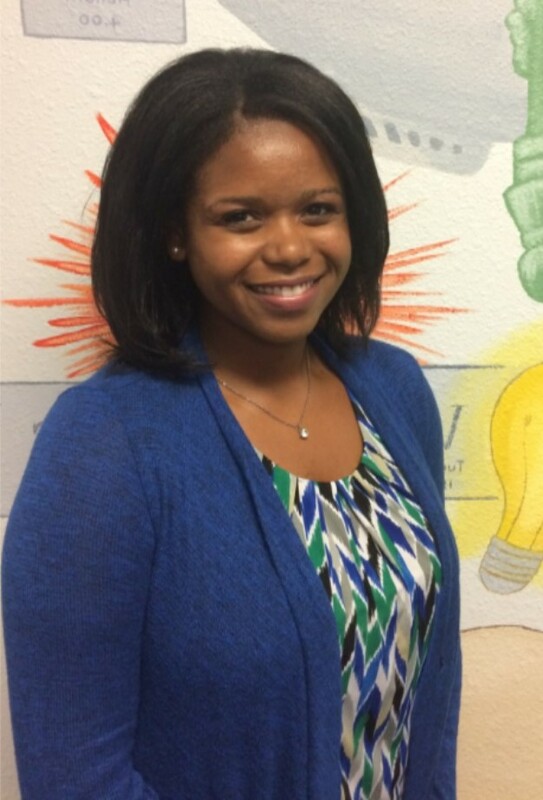 After graduating, Ms. Mitchell began a successful seven-year career with Hays CISD. During her time in the classroom, Ms. Mitchell grew a passion for her students to enjoy learning in all subject areas through song, project-based learning and inquiry. She helped write curriculum for various district STEM camps that incorporated student engineering. Ms. Mitchell loves her career as an educator. She feels the most rewarding part of her job is seeing the light and joy in her student's eyes, especially when they have reached their own goals or are successful. She also loves to sing, be with family, and travel. Ms. Mitchell joined the STARBASE crew in August 2017. Ms. Marissa Bartels, aka "Titan"
Ms. Bartels earned a Bachelor’s degree in Elementary Education with a Minor in English as a Second Language (ESL) Education from the University of Wisconsin Oshkosh. Prior to joining the STARBASE team, she has experience as an ESL Educator and in Montessori education in Wisconsin. Ms. Bartels is passionate about advocating for ESL students and creating lifelong learners. She is enthusiastic about putting learning into the hands of students and guiding them to success. Cheering for the Green Bay Packers, enjoying the outdoors, and exploring her new home, Austin, are her favorite things to do outside of teaching. 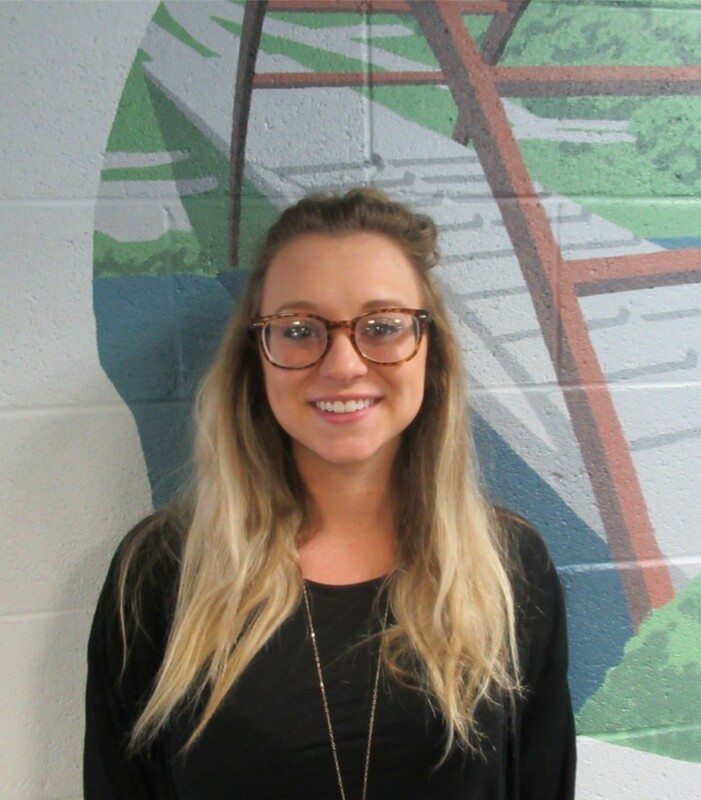 Ms. Bartels joined the STARBASE crew in August 2018. 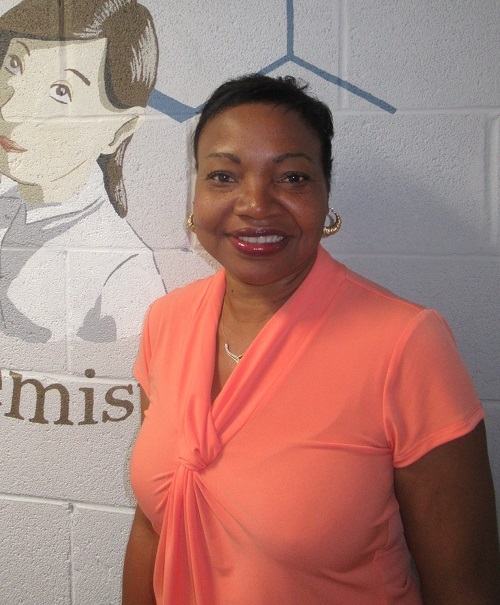 Mrs. Hill-Bryson is a native Texan with 25 years of administrative support experience and six years owning/operating a childcare facility. 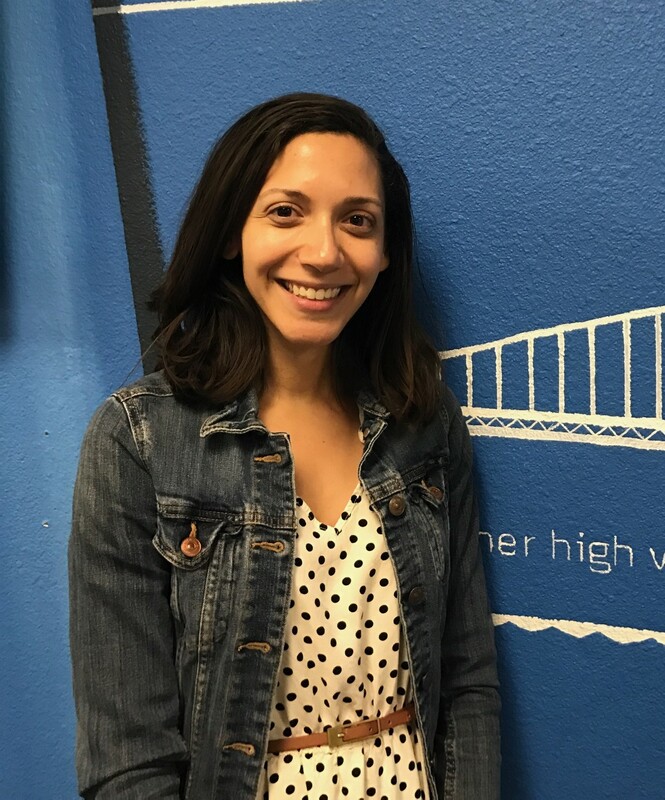 Though she lived in Phoenix Arizona for seven years, she has always considered TEXAS ‘home.’ Mrs. Hill-Bryson is passionate about helping all students identify and pursue their goals, and feels one of the best ways to touch their lives is via learning and education. “To learn is to teach, and to teach is seeing the results throughout the entire world.” She enjoys spending time outdoors and taking advantage of all the fun time in the sun in Central Texas. Mrs. Hill Bryson joined the STARBASE team in May 2018. 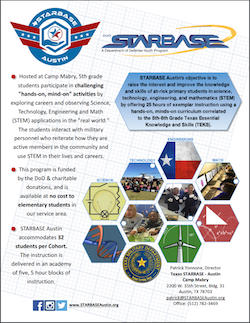 Texas STARBASE Austin is located in Building 31 at Camp Mabry, Austin, TX. 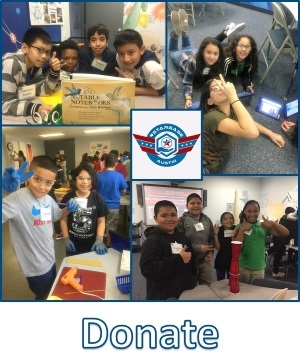 501(c3) Board of Directors purpose is to support Texas STARBASE Inc.
For information about donating to STARBASE Austin, please contact Emily Bell at 512-782-3470 or by email. “Hands down, STARBASE is one of the best youth programs out there. What a great way to influence our next generations of leaders in math, science and technology. My daughter shows tremendous interest in such areas, thus STARBASE was the icing on the cake. She loved it! On the way home he couldn’t stay quiet. He would tell me everything that happened that day. He loved it! When I visited for lunch I noticed that the kids were engaged and enthusiastic. I could tell the program was successful! He asked if he could do it next summer. It was fantastic!